The story is old, but probably true. This attitude (consciously or not) seems to have permeated the teaching of college/university science courses. The other unhealthful practice is to have large classes (especially at the freshman level) often taught by graduate students who have not had any significant training in how to teach and often are not native English speakers. The net result is a student who struggles, learns how to regurgitate what was said in class, and often does not understand the material in a deeper way. Dr. Gregory Light and his colleague Dr. Marina Micari both hold Ph.D.s in education and have extensive experience in higher education. Their goal is to transform science education from an arena seemingly populated by only the few talented individuals with innate abilities to a much broader section of the student population. They are attempting to do this through the Gateway Science Workshop that they have established at Northwestern University. The basic pedagogical approach follows the trends in education in other disciplines: Collaborative learning is stressed instead of competition. A major focus of this program is the emphasis on conceptual understanding and problem solving, not just memorization of facts. Facilitators work with each group as they explore issues together. These facilitators are older students who have taken a yearlong education course to train them for the program. One of the ideas behind this group approach is based on real life: scientists today do not work in isolation, but in teams, often interdisciplinary teams. The student-led teams discuss issues and develop solutions. Later on they begin to develop research projects of their own. How effective is this program? The data provided by the authors focuses on such things as retention of students, but there is not a lot of information about grades. It might be worthwhile to carry out a longitudinal study to see the science and math grades over the course of their undergraduate careers. It would also be worthwhile to study how many of these participants go on to graduate school or professional school (medicine, dentistry, pharmacy, other postgraduate programs) and to assess their long-term performance as compared to students who did not have this enrichment. Through the book, the emphasis is on students, both as learners and as facilitators of small groups. 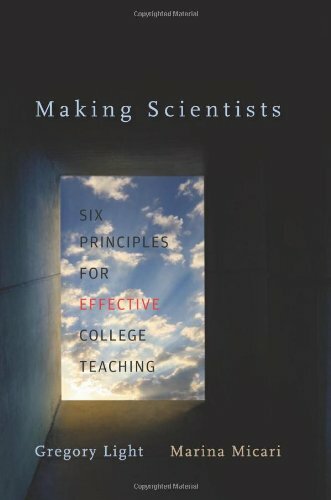 Faculty does play a role, but it is not clear the extent of buy-in by the science faculty. One of the many benefits of this book is an extensive bibliography that explores the science education literature. Making Scientists is a valuable contribution to the growing debate about how best to education the scientists and citizens of tomorrow.